Christ's spousal love for the Church. Part Two, Section Two, Chapter Three, Article Seven. United in Love, Strengthened for Service. Want To Marry In The Catholic Church? Call the parish office at least 6 months in advance to request a Marriage Info Form. Couples must have their first meeting with a priest or deacon to confirm a wedding date before contracting a reception facility! Would you and yours like to renew your marriage vows? Come and celebrate with the faith community. 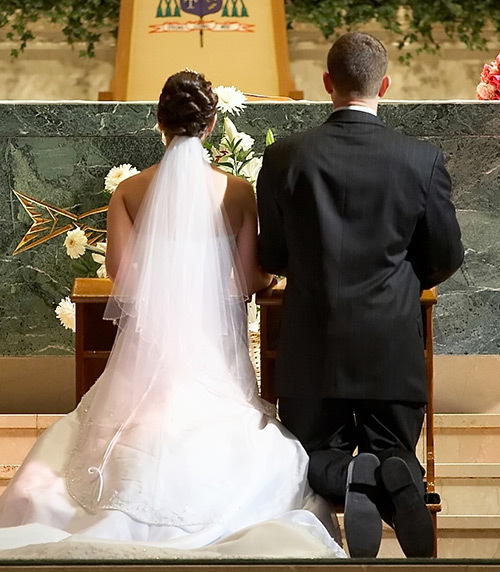 Anyone wishing to renew vows can do so at the 4:30 Mass on the 4th Saturday of each month for couples married in the Catholic Church who are celebrating any “5-year” anniversary. Call the parish office at least one week in advance to schedule. Pre-Cana Classes – Offered semi-annually on a Friday evening and Saturday in a classroom format on the St. John Parish campus. Contact the Archdiocese to register for classes: 410-547-5420 | cahaley@archbalt.org. Sponsor Couples – Engaged couples meet with and are prepared by a trained married couple at mutually- agreed-upon times. Married couples desiring to assist in this program are asked to contact one of the priests through the parish office. Engaged Encounter Weekends – Couples spend a “weekend away” in preparation for their marriage. This program is not offered on the St. John campus. The celebrant of your marriage will provide the couple with contact information to identify dates and locations.